Whether you are building a deck or having someone build a deck for you, there are a lot similar steps that you need to follow in designing and planning your deck. A couple of years ago we went through this process and have a great deck that we enjoy year round and especially in the spring, summer and fall. The picture above is the deck we built. 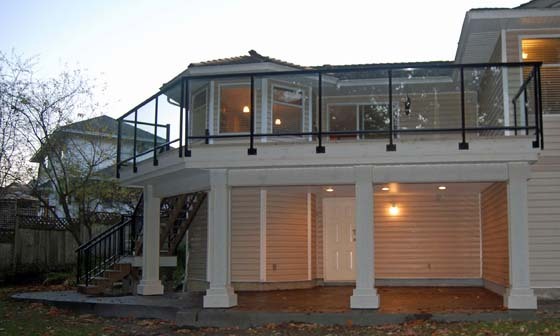 As you can see it is a second story deck with glass rails. The space under the deck is dry and has a stamped concrete and one day we will install a hot tub – that is another project. During this deck building project I learned a lot about designing, planning and building a deck and in the next few articles I will explain the process we followed. I hope these articles are informative and help you build the deck of your dreams. I will also include mistakes we made and our successes. There are two really fun parts of making a deck: the initial planning and when it is finished. At the start of any project there is the excitement of a new project and dreaming what you want. There is the middle that is a lot of work. Then you finish the project and you get to enjoy the fruits of your labor and hard work. Do I need a building permit to build a deck and what is the process? As you can see there is a lot of information to cover to build a new deck and too much for one article. My plan is to write one article for each topic per week. Once the article is finished I will post it and link the topic above tot he article. This way you can go right to the topic you are most interested or relevant for the phase of the project you are at. If there is no link yet then I’m still working on the article and will post it as soon as I can. I will probably write the articles in the sequence above, but please leave a comment below if there is one step you really want to read and I will make it a priority. Also, please leave comments, questions or your experiences in deck building. This deck that you have on your second story looks fantastic! I love the look of it, I think that it would be so fun to have a deck that big. My wife has wanted a deck for years, so it would be really great to be able to get one built like this. Soon I would like to start designing it so that we can get it all planned out. Then I think that we will end up getting a contractor to help us get the job done. Thanks for the post, it was really helpful!